Major League Baseball’s most intense rivalry has bad blood again. 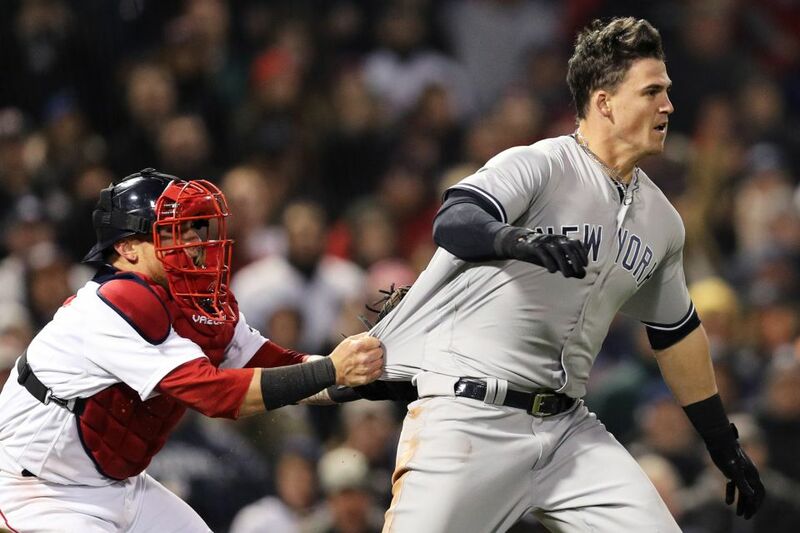 On Wednesday night at Fenway Park the benches cleared on two occasions in a game between the Boston Red Sox and visiting New York Yankees, with Tyler Austin the Yankees designated hitter the center of attention in both incidents. The second incident, in which the Yankees DH was hit by a pitch, punches and shoving took place. After the game, Austin told reporters that once he was hit by a pitch, things were going to happen. This storied rivalry has seen several fights over the years, but this one on Wednesday, in a game that New York won 10-7, included the new generation of players like New York’s tall slugger Aaron Judge, who hauled off a pitcher for the Red Sox in a headlock and Austin punching an assistant coach for the Red Sox. The problems started during the third inning. Austin was at first base and a bunt was made by Tyler Wade and Austin ran to second where he slid into Brock Holt the Red Sox shortstop, who did not appreciate what he considered a late slide. After Austin was called out, he and Holt start yelling at one another and players from each dugout and bullpen raced onto the field. Holt said Austin’s slide was late and with his spikes up, Austin disagrees calling his slide clean. That incident was quickly settled and the game returned to play but four innings later things turn for the worse, when Austin was hit by a Joe Kelly 97-mph fast ball on the left elbow. The previous pitch by the Red Sox reliever had knocked Austin off the plate as it was well inside. Austin become enraged when hit and threw his bat to the ground followed by his helmet and charged the mound. Kelly appeared to egg Austin on as the player neared the mound motioning to him to step forward as the benches and bullpens once again emptied. As Austin and Kelly were tussling a punch thrown by Austin hit Carlos Febles the third base coach for the Red Sox. Shortly thereafter Marcus Thames the Yankees hitting coach pushed Austin back while Judge walked toward the dugout. Judge took Kelly in a headlock in what he says was an attempt to take the pitcher from the fight in order to help diffuse the situation. Umpires ejected Austin, Kelly, Phil Nevin the third base coach for the Yankees and Tommy Kahnle a relief pitcher for the Yankees. The teams meet again on Thursday and time will tell if sparks fly again.